With only a little time to address all of the questions that have come up for the spring 2010 ITS all-staff meeting, I thought I'd take a stab at answering some of the questions here. Will there be raises this year? http://www.budget.psu.edu/BudgetPresentation/2010-11/201011BudgetPresentation.pdf Anonymous: If we get raises, will our health care go up and our parking? We need a year to have no increases so that if we get a raise it will actually feel like one Anonymous: If we get raises, which I assume will be small, will ITS units still skim off the top and make everybody's raise even smaller? Anonymous: Do we need to bring hundreds of people into a single room to hear Kevin talk about this when an e-mail would work? Maybe these briefings should be via video like the State of the University. Signs are currently positive for there being a general salary increase this year, but no guarantees can be made. As soon as university leadership knows, we'll get the word out as we always have. The long term future of health care costs - to Penn State and its employees - is very much up in the air. In this regard, Penn State is no different than any other employer in any other state, in any other nation it would appear. With respect to "skimming off the top to make everybody's raise smaller" - that's misinformed and I can help. I hold back a small percentage of the general pool for the purposes of driving a larger differentiation among raises. The goal is not to drive everyone's raise down, but rather to increase top performer's raises. This all-staff, like the others, is being recorded. There is value to getting communities of interest together, face to face. We do it all of the time in settings like The Symposium, Security Day, the Web Conference, User Services Conference, TechPros, EDUCAUSE (all sorts of settings), I2, etc. I think ITS deserves the same kind of moment that we try to be part of in other settings. If you'd rather watch it at your leisure, that's fine. But there is - all be it difficult to measure - value in face to face fellowship when developing relationships that will be relied upon mightily in the future. connections being made or advanced. Again, hard to measure - but there's lots of evidence to suggest that lots of smart, dedicated people want that, in a variety of different contexts. Do you foresee all of ITS using one calendar and one e-mail system in the future? We're moving to an environment where there will be one unless a group has approval to do something different. Even so, under the best of circumstances, needing something like integrated free-busy won't go away. Even if there was one such system per institution, we still need to collaborate with people across institutions, organizations, etc. With Jeff Kuhns retiring at the end of September, people are wondering what's next? Obviously big shoes to fill! Any thoughts you can share about the future direction of the position? We've retained the ability to fill the position, but with so much analysis underway it is premature to think we know what we need going forward. I'd love for nothing more than to have Jeff be with us forever but that's not his future or ours. Once ours becomes clearer, we'll make that decision. It will be hard to make due without him, but we'll have to figure it out. Can you talk about your thoughts on continuing ITLP for both new employees and alumni of the program? The leadership principles are so relevant to ITS issues in our workforce, I hope it can continue to be reinforced. Anonymous: What's the real impact of ITLP? How is it viewed by those who have not been through it but work with those who have? Has there been improvement in those workplaces, or just addition of new buzzwords? We continue to invest in it because we continue to see a return on investing in Penn State IT leaders. To those who want to assess based on buzz word increase or work place improvement, I'd say it's more complicated than that binary choice, just as it is with everything else we do. Shared vocabulary, shared models are key for improvement in any realm (ask any sports team or orchestra). One measure of improvement from my perspective is that there are increasingly more people that are turned to for leadership on a variety of projects and initiatives. Everyone is a leader, not every does step up to it, not everyone wants to step up to it, some don't know how to step up to it. ITLP has helped. cjs: Should there be one place (web page) were all PSU end users can report IT problems? Would you support that ($$)? I love the question, probably because it gives me a chance to safely pitch what I think is the one initiative to rule them all. I believe that if we could agree to developing an institutional tier one help desk and make it happen, that we'd develop lots of collaborative muscles that would help us tackle other issues. Additionally, we'd reveal where it is there would be economies in normalization of services, and disaster if we did so. To more directly answer the question - yes, I'm of the opinion that there should be such an ability. Developing the will to pull it off is the trick and I hope that the activities underway for the next 6-36 months will create the right moments. 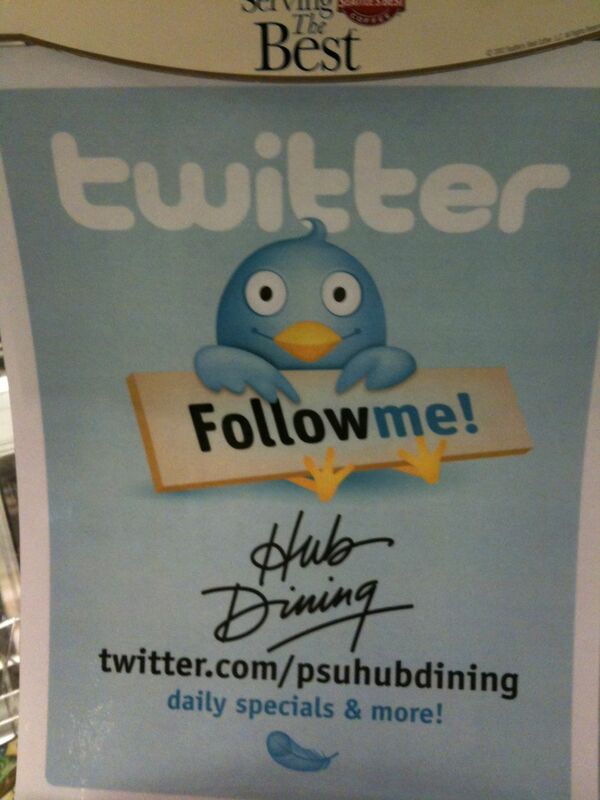 Why IT.PSU.EDU? I thought we are all ITS. It seems difficult to find information already. Is there something planned to start consolidating and combining our web services? The development of that site and the IT Connects programs are related to trying and develop a spirit of collaboration among 1,300 IT employees distributed over 100 organizations. Interestingly, we're collaborating better in the IT domain off campus than we are on campus - and that has to change in order to react to the new times. Additionally, the institutions that figure out how to collaborate within their distribution will be the ones that pull away from the pack that gets created in tough economic times. What will be the most important opportunities for Penn State when the new state-wide network becomes operational? I don't know. I'm not sure anyone knows. As I've considered this myself, I've compared to being able to ask myself the question in about 1992 as the Internet was being built and the campus backbone was being built. I'm not sure anyone could have predicted what's happened since then, both good and bad. I don't think we can abdicate our responsibility to anticipate changes, but right now I don't feel like we have enough knowledge to speculate with accuracy. I'm humbled by what I wasn't thinking way back when. I do believe, however, that rational speculation is important because the speed with which we enable our faculty and students to leverage the new capabilities can be a separator for Penn State. Reducing the gap to efficacy will be important. Can we be assured that PSU will continue to provide private insurance under the new healthcare law? I don't have any information to be able to present anything close to an authoritative response. But watching what is happening across higher education, the US and the world - employee benefits are changing and very likely will change. The kind of change posed in this question seems unlikely, but it is hard to use the word guarantee with anything these days. How important will it be for key ITS services (e.g., ANGEL, eLion) to play in the "mobile" environment? Anonymous: Isn't this obvious given the amount of research and discussion regarding mobile learning and students' expectations? Very. I think it's important to examine what aspects of all services lend themselves to increase value in a mobile context and attack those. A reasonable question to ask is - how can longitude and latitude be used to enhance the experience? There are handouts for most of the presentations, available at the links. Here at Penn State, we've got things cooking in each of these areas but to varying degrees of organization and mobilization. Last week we held what I think was a very successful fall meeting in Washington DC. I used the opening plenary session to survey events of the last year and to introduce the 2009-2010 CNI Program Plan, which was distributed at the meeting. The Program Plan is also available online, linked from our home page at http://www.cni.org. We'll be mailing printed copies to member representatives in the new year, and can make additional copies available on request. We took video of my opening talk, of Bernie Frisher's wonderful closing plenary, and a few selected breakout sessions. We'll be putting these online over the next few weeks, and we'll put out an announcement to CNI-announce when they are ready. We're also accumulating presentation materials from the breakout sessions and putting that online as quickly as possible; this should be complete early in the new year. I also used a substantial part of last Thursday's CNI Conversation audio event to reflect on some of the developments from our Fall Meeting, and also from the Fifth International Data Curation Conference, which was held in London in early December. The recording of the CNI Conversation is now available through our web site as well. I want to provide a few pointers and citations to things that I mentioned in my opening talk, as I've gotten a few questions about them, and also give visibility to some other related materials. Elinor Ostrom shared the 2009 Nobel Prize in Economics, which recognized her work in understanding the economics and governance of commons of various kinds. Of particular interest to many in the CNI community would be the 2006 book that she co-edited with Charlotte Hess titled Understanding Knowledge as a Commons: From Theory to Practice. http://www.rin.ac.uk/our-work/using-and-accessing-information-resources/disciplinary-case-studies-life-sciences and are well worth reading to understand some of the barriers to implementing data sharing policies. Some of the very interesting recent developments in citizen science are covered in the excellent recent report by Liz Lyon of UKOLN titled Open Science at Web Scale: Optimising Participation and Predictive Potential which is available for download at http://www.jisc.ac.uk/publications/documents/opensciencerpt.aspx . On the importance of special collections: the ARL/CNI Fall Forum, "An Age of Discovery: Distinctive Collections in the Digital Age" was held on October 13-14, 2009. This was a superb event. You can find links to audio records of the talks and to presentations at http://www.arl.org/resources/pubs/fallforumproceedings/forum09proceedings.shtml. Several outstanding papers from this conference, including a somewhat expanded version of my own opening remarks addressing why I believe that special and distinctive collections are of such strategic importance to the agenda of the Coalition, have just been published as the December 2009 issue of Research Library Issues and can be found at http://arl.tizrapublisher.com/view/9ishf/prvp3/default; they are also linked to the talks in the proceedings page. This is the second August of moving what is fast becoming not a child into the residence halls at University Park. I know that President Spanier has long accompanied families and students as they get their first tastes of Penn State and he broadly shares his experiences. His experiences help make Penn State a better place to be, and there is direct impact on improving the boarding process for residence hall students from year to year. My observations and reflections will be old hat for colleagues in student affairs and housing and food services. Even so, I wanted to take the time to share two observations from these past two years. The first observation that has struck me both years is the preparedness and friendliness of everyone engaged in all of the move-in processes. Parking officers, move in volunteers, resident advisors, food staff, Computer Store staff all are eager to help with a smile. If THON is when the world learns about how great the Penn State student body can be, move-in is when the students find out how deeply Penn State staff care about students and parents getting off to a great start. I'm sure there are exceptions in some people's experiences, but in these two years the consistency and ubiquity of this attitude is remarkable. There are many ways in which I feel pride in being a Penn State employee, but nothing has matched the pride in move-in over 20 years here. The second observation that strikes me hard is the anxiety level of some students. Everyone is putting on a good face in the craziness of moving; unpacking, setting up, and getting to know the campus. But if you take a moment to sit down somewhere, anywhere for a little while you can see unmistakable signs of high anxiety. For some, it is the specter of being far from home. For others, it might be coming to a campus of tens of thousands from a high school, other campus location, or even a community that is much smaller. The size of Penn State hits hard on move-in day. I can't imagine that too many people accurately envision the scale of what happens on move-in day until they actually confront it for themselves. That anxiety doesn't always dissipate quickly. Once the family leaves to return to wherever home may be and the awkwardness of a new roommate takes hold, and the emptiness of the next few hours hits a whole new set of worries can rush in. College and department events, student group and club activities are aplenty, but with so many options it is hard to choose. Classes start soon enough, and a rhythm starts to take shape. But even then, there are classes of hundreds, classes of dozens, classes with clickers, and each in its own building. Bottom line for me, and what I'm carrying with me as I walk across campus at class change, is that for every 10 students I walk past at least several of them may be in a high state of anxiety about where they've so carefully chosen to study (and to afford to study). I don't often get a chance to start a conversation, but if I can hold a door open, make a comment about a text book, the weather - anything - I do it, just to try and keep the friendliness they encountered at move-in, last a little while longer. I have not gone back on my blog per week pledge - honest. Vacation knocked me off a week and I'll admit that the knocking resulted in a disruption from which I'm only now recovering. In short, the pile was bigger than I expected when I got home. This was a couple of weeks full of conversations that highlighted a typical tension in some of the dialogue we have with partners and customers as we discuss services and how to plan and execute on future needs. And then someone sent me a link to an absolutely fascinating article in the recent article of Scientific American, "What makes us human?" Almost every meeting and conversation I have these days has some sort of connection to Penn State University's Strategic Plan. In particular, when I'm in the conversation people want to talk about "Goal 6 - Use Technology to Expand Access and Opportunities." There's lot of conversational churn about Goal 6, some of which has been purposefully started other which is ad-hoc. There have also been formal conversations already and other formal conversations in progress. The College and Campus IT Directors have done a thoughtful analysis of the plan and Goal 6, and the Integrated Administrative Systems Committee has dispatched a sub-committee to begin to shape how it is the multiple spheres of influence in the business computing of the university will speak-up in this conversational moment. So what does the Scientific American article have to do with any of this? Regardless of what kind of conversation is being had, or if it is taking place among business computing leaders, business leaders, academic computing leaders and/or academic leaders the data is clear about what makes for a successful conversation and one that leads to almost nowhere. When the dialogue is about our differences and our similarities, precise and generally agreed upon pictures get painted. If differences are all that is debated, progress is hard to measure. And while it hasn't happened yet when I've been in the room, a conversation about nothing but similarities would have some value in one aspect of what we need to do better coming out of the strategic planning processes, but only one. We need to develop awareness about the endeavors we can do more efficiently together, so that we can have the resources we need to work together to enable the differentiation that each area - business or academic - needs to be successful. Sooooo - back to Scientific American. We're bound by the vast similarities in our organizations, and there's lots to be learned about each other by recognizing that. Let's start our conversations there, and end them at differentiation, competitive edge, etc. I believe that's this is the time in which we find ourselves, both in terms of fiscal pressures and along the timeline of IT's role in higher education. Burger King let's you have it your way. TiVo allows you to watch your favorite TV programs whenever you wish. You can read almost any newspaper article written in the whole world. You can tune into audio and video podcasts covering a dizzying array of topics. We have choice and we love it. I can't stand that my cable company won't let me pick and choose what channels I want to pay for and watch. I can't stand restaurants that have "no exceptions" on sandwiches - it's a sandwich for heaven's sake. I have no patience for online ads that won't let me skip them if I choose. I get agitated when I don't have choice. We want what we want, when we want it, how we want it. We're addicted to customization and freedom. The internet has amplified freedom of choice (of distribution channel at least) and customization to a scale that can feed our seemingly insatiable addiction. When I think about myself and others as contributors via these channels, I get to enjoy the downside of all of this freedom of choice. In order for me to stay in touch with or communicate with colleagues, friends, and family I have to be plugged into The Matrix multiple ways. As I sat down to type this, I am running a client or web pages that do instant messaging, twitter, gather my RSS feeds, e-mail, several favorite blogs, several more favorite web pages, facebook, LinkedIn, Plaxo, and ning. For me to reach or be reached - oops, hang on...my daughter just sent me a txt msg - I have to consume and contribute via multiple channels. If I ignore a channel, say twitter, I do so at my own peril. I'll miss out on all sorts of fascinating (yes, fascinating) chatter about information/happenings relevant to my job and tweets that make me laugh if I walk away from twitter (or other channels of distribution). To be effective, I have to be able to express ideas and thoughts to many people. To be effective, I have to be able to ingest ideas and thoughts from many people. Because there are many channels, I have to tune into many of them to be effective. I have no choice. I'm not complaining at all about the multiple channels even though it might sound like it. I did for a little while, but then I boiled it down to a value judgement about striving to be effective or not. I've chosen to plug in and listen, plug in and share. So I do have a choice, but it isn't the one I first thought it was. Bad communication comes in many forms. It can be no communication, it can be poorly formed communication. Now, it can be a mismatch in how you are choosing to contribute and I am choosing to consume. If our choices don't line up, we're back to no communication. If only there were something like a wave of communications :-) . Until I can surf those kinds of waves, I'll continue to choose to plug in and reach out. What do you say to someone you haven't seen in a long time? I'm at that age that I'm regularly bumping into old friends, school mates and the like that I haven't seen for many years. That first encounter is always a bit awkward when it's been a long time. So it is with getting back to blogging. I've set a goal of one per week (I know, weak in the eyes of the daily writer) but I think it's a goal I can manage. And - to answer the question, "Why have I/we waited so long to chat when it is so easy?" - I truly haven't seen my lack of blogging as an abandonment, just that I filled up that time with other kinds of communication. It is most definitely time to get back to this platform, stick to it for awhile, and see what happens. There is much to write about. There are many conversations that have been started around the university's strategic plan and those goals which information technology figures prominently. Now that the plan is official, I suspect and expect activity to pick up and formalize. The conversations to date, and even some of the real work to date on the plan, will serve the Penn State IT community well. Not a moment of it will be wasted. As someone who likes to digest bad news before good, I'll serve it up the same way. I've been unpleasantly surprised that coming out of almost every conversation, I hear a reflected wave - to varying degrees - that the plan and my reaction or ITS' reaction to it is some sort of "grab." I know how I'm thinking about it, I know how people in ITS are thinking about it and I'm also intensely aware of how I've been talking about it. If anyone thinks or talks about the plan as some sort of grab, it is on the way they are listening, not in the way anyone is thinking or talking. Please help us all get this reflected wave on top of the table so it can be talked about openly, or we'll have to wrestle this silent killer in our attempt to plot an improved course for IT planning every inch of the journey. The complexity of doing this is sufficiently difficult in its own right, the fiscal times make it even more so. I've also been pleasantly encouraged that there seem to be a lot of us who are genuinely starting to think about what we do as information technology for Penn State, and that we do this as partners as opposed to competitors. We're all dealing with innovation spaces in our viewfinders and in those spaces there should be a friendly sense of competitive spirit. Being a good forecaster of technology and picking winners is a part of our ethos and skill set. Most of our portfolio, however, is in working together to solve the problems of all academic, administrative units regardless of longitude and latitude. When I encounter that sense of partnership, it is really energizing. It is in this collaborative space that we'll be working dominantly in the coming years - so getting past this stage of conversation in as healthy a manner as possible is important, really important. Now on to something that I think will be more typical as I get back into the swing of blogging. Last week, I had the opportunity to visit Hershey campus again. I've been there many times over the last 18 months to talk about a wide variety of issues. This most recent visit was representative of the many dimensions in which the two campuses (Hershey and UP) are rapidly getting closer together. There were conversations around the support of different kinds of research, managing identity in the ridiculously complex world of a teaching hospital, improving the boarding process for new medical and nursing students, being more hospitable to our students who receive prestigious fellowships off campus, and a very long conversation about almost everything you can think of in the technical layers of information technology. I was very fortunate to receive a back stage tour of the Cancer Institute, only 6 days before they moved patients into the new facilities. The space was visually appealing and the instrumentation mind boggling. Most memorable, however, was the enthusiasm our tour guides (Joni PItcher, Rich Rauscher) had for the value that the new building will have in the lives of cancer patients and their families. It was really inspiring and one of those moments that had me remembering why it is I love working at a research university like Penn State. It is easy to get disconnected from how Penn State makes a difference when you're working at the information technology layers but when you get reminded, it is both liberating and energizing. To start this entry, I went to to images.google.com and searched for "nsfnet". Here's the first picture that came up (at least for me). I can't seem to have a meeting or conversation on campus where someone wants to ask about the cloud, insist that the cloud is THE future, claim that the cloud is dead, or make a case that the cloud is the wrong direction. That picture sure looks like a cloud to me and it is from 1991. For me, "the cloud" first appeared in meetings at either the Cornell National Supercomputing Facility or the John von Neumann Center when supercomputer center staff would talk about the emerging network that was being created to connect the National Science Foundation's supercomputing centers. So - in the cloud conversations I find myself getting into, I usually take the position that the cloud has been around for a long time and it will continue to be around. It is neither a silver bullet nor a neutron bomb, but it is changing what we do and how we do it every bit as profoundly as that "first" cloud did. We're experiencing and creating a set of influences that are making the cloud much richer than "just" TCP/IP connected nodes, all leveraging a rich software stack to make it all go. Personal identity is being pushed into the cloud, GENI promises a future where the cloud itself is an innovation space (as opposed to innovation happening at the edge or node), Web2.0 services feel like they are certainly a part of the cloud, and storage and transactions themselves are every bit as much a part of the cloud as well (here, here, and here). As it is and was with NSFnet and eventually the Internet, responsibilities were/are somewhat clearly delineated. Campuses know what they need to do (run campus data backbones), federal organizations and companies know what they need to do (run national backbones), and building occupants/research labs know what they need to do (run local backbones). Protocols are mostly interoperable, there are lots of hardware options, and while there are varying degrees in difficulty in running a backbone of any size - it has been successfully done hundreds of thousands of not millions of times over during the course of the last twenty years. The most important candidate to make as fundamental, interoperable, reliable, secure, and well funded (well understood at least) as the network in the cloud is storage. 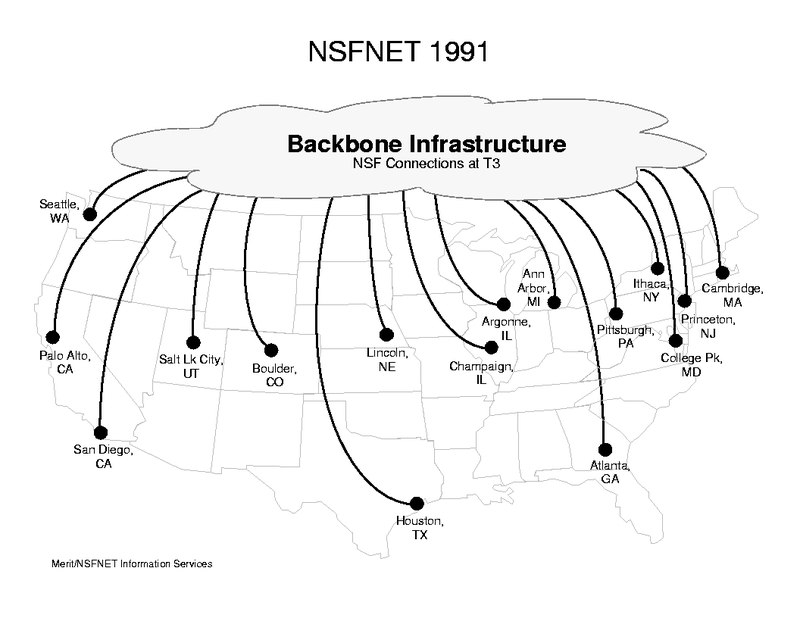 With apologies to those who know much, much more than I do about the nitty gritty details of the history of the Integrated Backbone at Penn State, I believe we're faced with the challenge of doing for storage what was done for data networking. What would an integrated storage backbone (ISB) look like at Penn State? Now that we're getting better at routing - securely and privately - attributes about people around the cloud, how do we make attributes about information discoverable and routable? What does the campus have to do? research labs? business units? There are gobs and gobs of conversations going on about this at Penn State, each gob with its own spin and concern. I believe we need a guide post to serve all conversations because there can be no one conversation to rule them all - there's just too much happening at once to hope for that kind of conversational model. At the moment, I'm throwing out the idea of talking about and defining the Integrated Storage Backbone at Penn State for at least a little while to see what takes hold. If you have any ideas about the concepts or the conversation construction, I do hope you'll share them with everyone here. I attended the sciencecommons presentation at CNI 2008 and was struck but how similar it was to presentations I gravitated to at IEEE/ACM Supercomputing conferences, years ago. Neuroscience is, apparently, a (the) poster child for sciencecommons. Listening to this presenter (John Wilbanks), revealed that - as it was years ago with both vectorization and parallelization on large scale computers - he is a scientist who has endeavored to become an expert in tools in a different domain, in this case in data construction and deconstruction. He used Dublin Core terms with the ease that physicists years ago would take about loop ordering for Cray supercomputers. He knows RDF instead of cache structures, he knows SQL statements instead of FORTRAN or C. He knows copyright, ontology, provenance - as opposed to loop unrolling, compiler directives, memory management. A major difference here is - in the high performance computing area we have to acquire resources to develop capacity and therefore we can see a training or awareness need hit many months out. With data oriented discovery, the asset already exists, what we lack are properly skilled faculty and staff to do this for themselves. What can IT organizations and libraries do to help close this skills gap? I'm not suggesting that there aren't already people who possess these skills, clearly there are. But we may be at a point in time when, just as was done with tool development and expertise with supercomputers, where what's needed is programmatic training and awareness raising about what is possible with the tools of the day. What can IT organizations and libraries do to help close these gaps? Is that where the responsibility lies? If not there, where? Tools exist, but they are difficult to use. Policy and law are barriers as much as they are protectors. Waiting for the tools to become simpler to use and for policy to catch up with the discovery needs of our communities would be foolhardy. Taking up knitting or tetris might be more productive than waiting. This was a really exciting presentation that represented lots of possibilities, and challenges. I aim to make it a point of emphasis in the months ahead. I attended a session at CNI 2008 that described the Data Audit Framework, a JISC funded initiative. Four UK universities are participating in the pilot. If you don't want to read the rest of these notes, I'd say it all comes down to one bullet for me - taking on something like a DAF "enables the development of a data strategy." Sounds painfully simple, but this is something I spend a fair amount of time worrying about. As faculty develop and create data associated with their funded research, how can we establish a culture of concern (thanks Candy Yekel) regarding the stewardship and curation of that data? In my travels around campus, I believe that many people think that these issues are simply being "handled" and in some cases they are, in many others I expect they aren't. I liked the concept and execution of this framework because as developed it is non-threatening but can yield positive outcomes for better managing (protecting, sharing, curating, archiving) research data. The raw notes follow. "Enables the development of a data strategy"